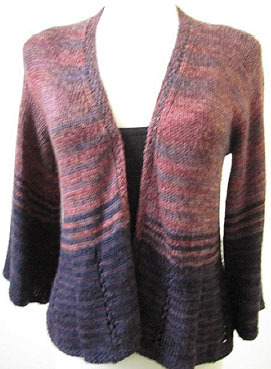 Artyarns Ensemble Silk & Cashmere, Ensemble Glitter & Beaded Ensemble CLOSEOUT! 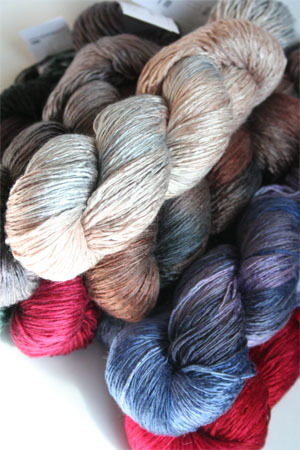 The cashmere and silk yarn combination is well known in the knitting world - but noone's done it quite like Artyarns. Side by side, a strand of silk and a strand of cashmere cozy up to each other to create a single yarn that is singular in it's softness and color depth. It's unplied, so it doesn't curl or unravel, and this allows the colors to show undiminished by any twisting, which can make other cashmere silk yarn blends look dull (the twist absorbs the light, this yarn reflects it beautifully.) Incredible yardage, too. A luxury yarn that is a great value. Listed below are all colors available in Regular, beaded and Glitter Ensemble. These items has been discontinued and are closeouts. No further Discounts, and limited to stock on hand. Included with this purchase is the Ensemble Kimono Jacket Pattern I221 as a download! Please check the drop down menu to check for all available colors! To view colors that are listed in the drop down but not shown above, please use the YARN SEARCH at the top of the page - but in the color number to view the colorway in other fibers. Please note: The dropdown doesn't always update if an internet connection is slow - if the number of skeins is not showing - refresh the page or add an item to your cart to see if it is still available!